I don't really have much of a post today as I ended up coming home a day late from holiday as I was enjoying it so much! Also as I type I'm currently getting my hair done at Headmaster's Mayfair Salon so Im pretty much all over the place. Another Iphone snap but, Hey look at me blogging on the go! How very modern blogger of me! 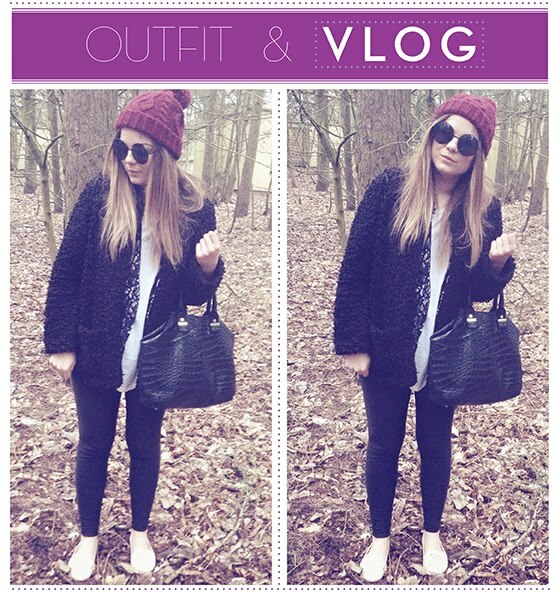 Also at the bottom is the vlog that I made of a few days ago while I was away with Zoe at Center Parcs. If you want to see me makeup less and looking less than my usual glamorous self then go ahead and check out the video! Normal blogging will resume tomorrow and I'm actually planning on doing a styling video/post (like this one or this one) for my channel so if you have any suggestions please leave them in the comments! PS. Big thanks for Katie for uploading my image for me as it wouldn't work for me! She's forever helping me out bless her! I loved the video! You're really natural at vlogging :) Looking forward to seeing your hair done! I really loved the vlog, you should do more! Love the coatigan, it looks so comfty! Such a simple but gorgeous outfit! Great post absolutely love the look! love this look! casual but super fashionable! great combination! I love the casual look! That kimono is beautiful!! Love the outfit! Want the beanie! I love your modern blogging technique! Also loving Zoe's hat on you. such an effortless but lovely outfit, I want that coat! Your videos are always so enjoyable. Great vlog Lily, how cute are those owls! Zoe's skirt is lovely! Love the vlog! and the beanie! !